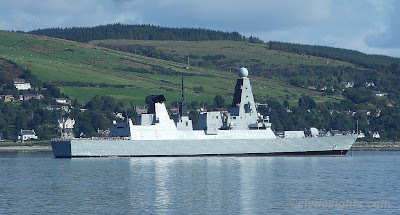 The lead ship of the Type 45 destroyer programme, DARING, arrived back at the 'Bravo' anchorage yesterday evening, following completion of ther third set of sea trials. This afternoon DARING returned upriver to Scotstoun, her birthplace, for the final finishing touches to be applied before she is handed over to the Royal Navy. DARING is due to remain on the Clyde until early next year, then head for her new home at Portsmouth, and start her career as a commissioned naval ship. By that time, the second ship - DAUNTLESS - should be undergoing her first sea trials. ALI CAT and GEORGETE K.